The best method to stop procrastinating, boost your productivity and finally build a side project. When you read inspirational articles about side projects, it fills you with the right positive mood that makes you believe that you can create anything. You think today you have learned something incredible. How did you even live without this article before? Now everything will change. Wow! After 2 hours, you close your laptop and go home. Tomorrow you can’t even remember about that article. You no longer remember all those things you read and the conclusions you did. Nothing. Today guys, we are going to change your tomorrow. Tomorrow is the day when you finally connect your mind with your hands to build a side project. The day when you will pick something you are passionate about and start building a business around it. Tomorrow is the hardest day in your life, but you will remember that day forever. For now, I’m going to tell you the method that changed my life, and it will change yours as well if you give it a chance. I created this method while I was building my first side project. Each day, as I sat in front of my Mac, drawing designs and shots for Dribbble I realized I don’t want to be just a designer, I want to build things and see it come to life. I’m tired of comments on Dribbble like “Awesome!”, “Nice”, “Stunning shot” and these comments do not make me the person I want to be. It simply doesn't make my life better. I want to see my projects live and I want to go through the process of building a project from 0 to launch. So I thought it’s time to change so I started to learn new things, read books and developed my projects. During this process, I created my “Learn & Earn” method which I want to tell you about. Learn and Earn’s formula has two important parts. It’s the soul which lies inside the building of any project. Through “Learn & Earn” I was able to stop procrastinating, overthinking and finally started to build my projects. I still use this method in my everyday life and some of my friends uses it as well, and they love it! You need to spend an hour a day to learn something new or get a new skill, and two hours to use this knowledge to build something that could potentially bring you money. 1h for learning and 2h for earn. That’s the golden ratio proven by me and my friends. 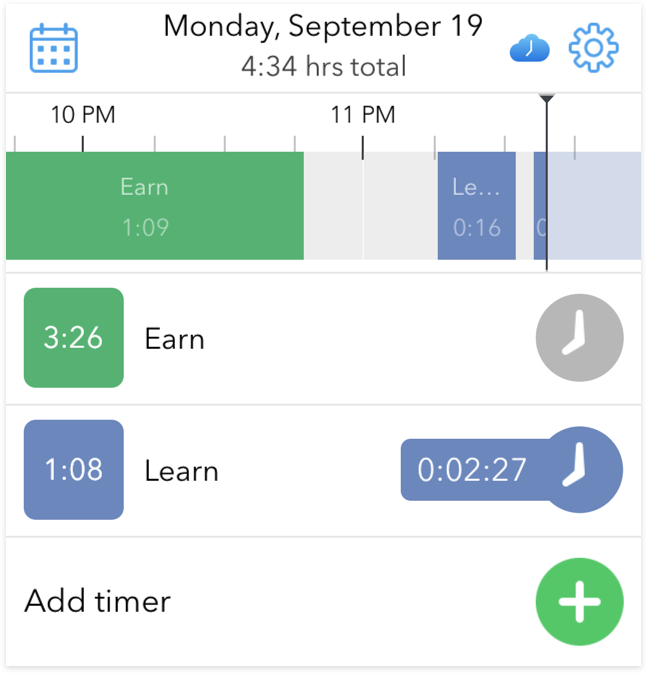 I use a simple timer app Hours which helps me track the time I spend for Learn and Earn. When I watch a course about Ruby on Rails or read a book about startups/productivity/design/marketing I set “Learn” timer. If I write a code, design a website or generate an idea about a new project I set “Earn”. So right now while I’m writing this post for you, I set the "Earn" timer. Just 1 hour to learn and 2 hours to earn everyday, except for weekends. During weekends you can just do Learn if you want, but my preference is to leave your weekends for resting. All the tasks related to your full-time job or freelance projects are not suitable for this method. You can’t include the time you spend on this work in the timer app. Only things that are related to your side projects. Also, I recommend to use any Journal app to keep your ideas and conclusions throughout the day. I use Day One app for this. You can’t keep all your ideas in your head. It’s pretty hard to constantly think about those ideas. When you write them down, you unload your brain and you can use your records later to make these ideas come to life. Next Big Me and the posts you’re reading right now was in my journal as an idea and now I have made this project a reality. Let’s dig deeply into every part of this method. Before you can build something, you need a skill. If you want to be able to develop any website, you need to get a web development and design skill. When you click a timer with a label “Learn” that means this is the right time to learn how to build a website. For sure this part is not all about IT skills. If you want to make your project around let’s say photography, YouTube videos or cooking, you can use this time to get those skills as well. Use “Learn” whenever you get useful knowledge and if it's connected with your plans about the side project. I have no idea what to build, how to get those ideas? I have don’t have any coding skills, how do I make a project? How to start, what are the steps? I had all those questions when I just started. When you have no any idea on what to do but you need to spend 1 hour for learning and 2 hours for earn, it’s a pretty stressful situation, right? So how do you get the answers? You will find the right answers from the books and courses you read. Books. Books give you the knowledge and inspiration. Good books can fill you with fresh ideas and the desire to do something. It always starts with one book and a month later you will find yourself around dozens of good books that help you solve the problems you have. While you read books, you can get answers to questions that you didn’t even think about. This is how we have transferred knowledge to each other over the centuries. Get a few books on your phone, tablet or Kindle. For example, let’s start with the famous Zero to One. Start reading it today and remember to set your timer to “Learn” every time you read this book. Always check if it is off when you don’t do anything related to this timer. Spend 1 hour to read, then set a bookmark and finish with it. You have to read for 1 hour for the whole day. If you want to read the book for one more hour, go ahead but keep in mind that you have to spend two hours for Earn. When you finish the book, read the next one. If you want to choose a book to read, a good source would be Goodreads, Amazon or just google something like “Best books for marketers”, “Best books ruby on rails”, “Best books for web developers”. Anything that you want to know but you never had the time to study. Read the first 50 pages of the book you just chose. If you don’t like the book, select a different one. Don’t waste your time for knowledge that can’t convert your time into a useful skill. Also, it’s critical to remember about your timer! Don’t forget to turn it on and off every time you do “Learn & Earn.” Set the timer only when you do something, not when you are preparing to do it. Courses on Udemy. You need to choose only those courses which can help you with building your project. If you don’t like the course, you can refund it and choose another one. Get inspired with projects you see. Set Product Hunt as the main page in your browser when you open a new tab with this useful Chrome extension. Everyday try to open 20 new projects and find out what this startup is all about. If you want to build a project, it’s always useful to know what other people do. Earn is about building things and applying the knowledge you just obtained into practice. It’s an important stage of your new day-to-day habit, and it will change you and the things that are happening around you. If “Learn” is your head, then “Earn” is your hands. You can’t do anything meaningful without Learn and you can’t translate your ideas to a real project without Earn. If you do both of them day by day, you will become a superman! Earn is when you need to transform any knowledge you learned into practice. When you just read how to install Rails and build a simple to-do app, it’s time to do your “Earn”. What other apps can you build right now? Or you just want to make the same to-do app to consolidate your new skill? Maybe you just read a book about photography but you never play with your camera, and you want to take great photos? Or you never dared to create a YouTube channel or blog that can bring you money shortly? That’s the right time to set your “Earn” timer and start doing your project now with no doubt! For the few first days, it will be difficult to sit near your laptop in a quiet room and start to do your Earn. Get the right mood; turn on the music and start. For me it’s just like this: I wake up in the morning, drink coffee, and turn on my playlist which helps me focus all the time. You can follow the playlist and try it for yourself. Every time I hear the first track I feel that now I’m inside my Earn and it’s the time to do something awesome. I made it as my everyday habit. The faster you take yourself inside this state, the more productive your day will be. If you decided you want to start building your project, tomorrow is the time when you should start. There is no turning back. No excuses! The crucial stage of “Learn & Earn” is how you look at this as a challenge. If you think that it will be unbelievably hard and you can’t handle it, don’t even start because you will just fail. Get in the right mood before you start. When I lived in Moscow, I smoked for five years. One day I just thought “Why can’t I just quit?” Many of my friends convinced me that it’s quite impossible. They tried to stop smoking many times, but it’s freaking hard. So back in day X: I tried to stop smoking, and I was prepared that it will be really hard for me. In the first morning without a cigarette I felt so dizzy that I barely landed on my feet. I mean I felt really bad and I think my body will die if I don't have a cigarette. When I went to the subway, I almost fainted. On the same day, I continued to smoke. After a few weeks a friend of mine gave me an advice to read a book by Allen Carr titled “Easy Way to Stop Smoking” and he said that after reading this book he never smoked again. I asked him if it was hard to quit the habit and he said it was the easiest thing he did. He just did it and now his life is better. In the same day I read the book in a good mood hoping that after reading it, I will finally stop smoking. I wasn’t thinking about what I will lose when I quit smoking. I wasn't thinking how hard it will be. I just thought about the positive things that will come into my life. That day, I stopped smoking. And I never thought about smoking again since then. As you can see in my story, it’s important what mood you're in when you start doing things. If you think about failure, you will fail for sure. But if you think about all the benefits that will fill your life while building a side project, it will push you towards your goals. For now «Learn & Earn» sounds like a big challenge for you. It is for sure! After you make up your mind, you should give 3 hours of your time to do this. Don’t be afraid of it. If our humanity did not want to jump higher, run faster, and live better we'd still be running around with a wooden stick. Imagine that today is the last day of your procrastination and tomorrow you will start to use this method! Get the right mood and start! I hope this post will help you to stop your inner battle with excuses and start to make awesome things tomorrow. Start using it for two weeks and when this method works well for you, write me an email. Also, you can inform your close friends that you use “Learn & Earn” and tell them more about it. Maybe they would like to join you. For now, guys, I need your thoughts. What else do you want to hear from me about using this method and side projects? You can subscribe to my list so you don’t miss my next post. P.S. I would really appreciate if you would share this post with the people who may find it useful.